Step 1: We will be using tblStudents table in this demo. Please find the sql script below, to create and populate this table with some data. Step 2: Create an ado.net entity data model using table tblStudents. Change the name of the generated entity from tblStudent to Student. Step 3: Download autocomplete widget from http://jqueryui.com/download. The following folders and files will be downloded. Step 4: Open "js" folder copy "jquery-1.9.1.js" and "jquery-ui-1.10.3.custom.min.js" files and paste them in the "Scripts" folder of you mvc project. Now open "css" folder. This folder will be present in "ui-lightness" folder. 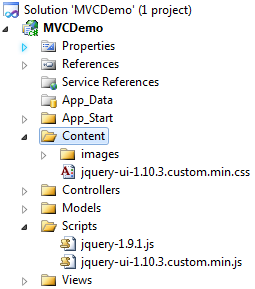 Copy "images" folder and "jquery-ui-1.10.3.custom.min.css" file and paste them in "Content" folder in your mvc project. If you are following along, at this point your solution explorer should look as shown below. Step 5: Right click on the "Controllers" folder and add "Home" controller. Copy and paste the following code. Please make sure to include "MVCDemo.Models" namespace. Step 6: Right click on the "Index" action method in the "HomeController" and add "Index" view. Copy and paste the following code. how to do autocomplete for all textbox. I like your tutorials very much. they are very helpful. it working with search button but not working autocomplete feature. its not hitting GetStudents method. I'm having the same issue as you too. I'm using MVC4 - Basic, but I'm not hitting GetStudents method. The only difference is that I'm using the latest jQueryui: 1.10.4 and instead of linq Startswith(), I'm using linq Contains() I'm using the exact folder structure as your picture above. ...remaining code put as it is ..!! like Gitu Digal I am interested in how to do autocomplete for more than one textbox, but in dependence of each other. For example: the field name depends on company, address depends on name. Autocomplete is not working .Followed all the steps as detailed. Hi Sir, Your videos are awesome. 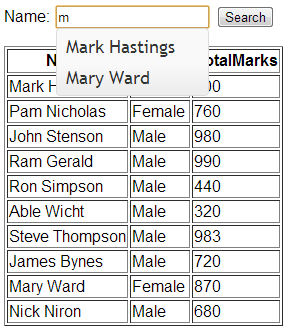 Can you please explain the videos how to generate the parametrized reports using SSRS in mvc. can you post your project here .. i did everything but still i can't get the autocomplete working ?? I did this and it started working for me. Thanks Venkat. It's a great effort by you and lots of people have been benefited (including me!!) by your excellent work. While working on this example one good friend of mine found the solution for addressing the issue of "autocomplete feature not hitting GetStudents method". Following is the complete code.